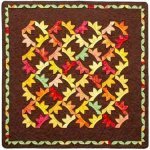 The pumpkin patch table quilt consists of 12 pumpkin blocks, 1 large center leaf block and 4 corner leaf blocks. 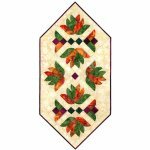 The table runner has 6 pumpkin blocks, 1 large center leaf block and 4 corner blocks. Use up your fabric scraps to make each pumpkin block a little different. My dimensional curved piecing techniques make all curves easy and fun. 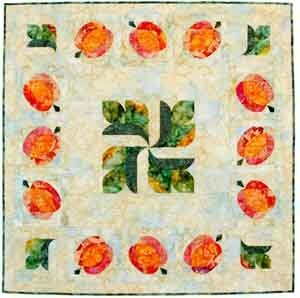 Detailed, easy to follow instructions on Cutting, Piecing and Quilting are included.